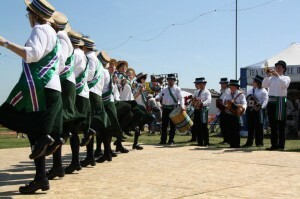 Silkstone Greens dance in the traditional North West Morris style of straight lines, sharp turns and high knees. We are now in our 12th year and come from the village of Dodworth where we get their name from the Silkstone coal seam that runs underneath. We wear a traditional style kit with straw boaters, purple and green sashes and traditional clogs. Our band are smart with top hats and purple and green sashes playing a mix of morris and colliery band instruments for their unique sound.